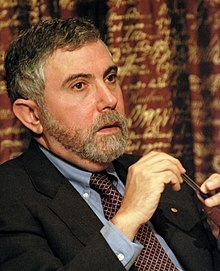 Paul Robin Krugman ( i/ˈkrʊɡmən/ KRUUG-mən; born 28 Februar 1953) is an American economist that is currently Distinguished Professor o Economics at the Graduate Center o the Ceety Varsity o New York, an a columnist for The New York Times. In 2008, Krugman wis awairdit the Nobel Memorial Prize in Economic Sciences for his contreibutions tae New Tred Theory an New Economic Geografie. ↑ "About Paul Krugman". krugmanonline. W. W. Norton & Company. 2012. This page wis last eeditit on 4 October 2018, at 06:28.